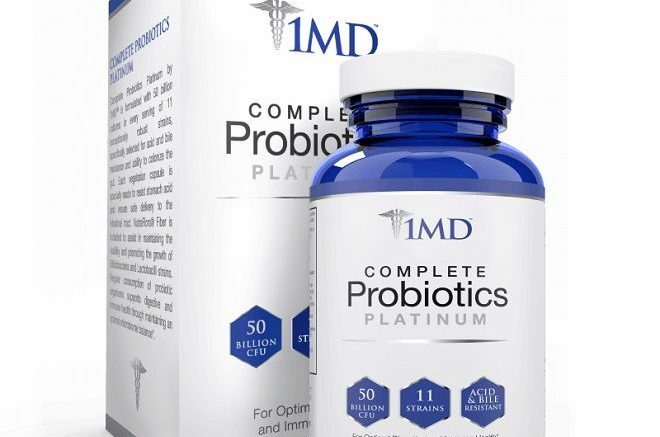 1MD Complete Probiotics Platinum Review – Does it Work? If you’ve lost your trust in dietary supplements, but you still need them to protect and regain your health, a product endorsed by a medical doctor, like 1MD Complete Probiotics Platinum, should appeal to you. Why probiotics? Because they’re the safest way to gastrointestinal and immune health. However, keep in mind that an endorsement does not necessarily guarantee quality and potency. 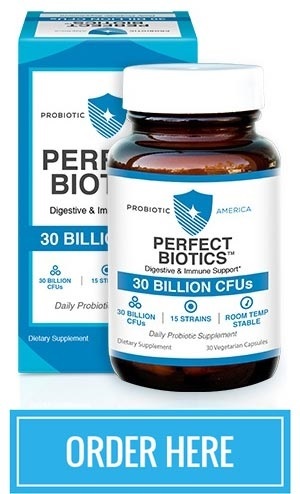 In a field like that of probiotic supplements, lacking FDA regulations, every detail is important, from product information to production process, manufacturer guarantees, and buyer reviews. Let’s see what 1MD Platinum has to offer! This supplement is the creation of 1MD, a company rather new on the market, but already famous for its probiotic, krill oil, and turmeric dietary supplements. Its representatives are two reputed medical doctors, David Kahana and Brian Greenberg, owners of several certifications and members of various reputed organizations. 1MD has a Better Business Bureau accreditation and an A- rating, due to the fact that they have been in the business for only 2 years. It is important to note that they have no complaints registered, and most supplement companies do not have a BBB accreditation. The manufacturer takes pride in using only natural ingredients in 1MD Complete Probiotics Platinum and its 2 other supplements, and no dairy, soy, fillers or GMOs. They claim their facility exceeds all FDA and GMP standards, and they test all their ingredients and products for purity and potency. This gives them credibility, considering that many websites sell supplements with nothing but a P.O. box address to support their claims. In many cases, their ingredients lists don’t say anything about potential allergens either. 1MD stand by their claims with an impressive 90-day money back guarantee, promising to refund any buyers who are not satisfied with their products. This is definitely a strong point in their favor, considering that some companies provide no guarantees at all, while others only allow 30 to 60 days for the same purpose. Their only probiotic supplement, 1MD Complete Probiotics Platinum, comes in bottles of 30 21×7 mm capsules, with the recommendation to take 1 capsule daily, before breakfast or between meals. This makes it easy to administer and convenient for those who travel a lot or have a busy daily schedule. Each capsule contains no less than 51 billion live bacteria, from 11 probiotic strains. The CFU count is among the highest on the market. There are, however, supplements with 100 billion live bacteria per serving. What is more important, the manufacturer guarantees the viability of the bacterial strains until an expiration date. Many supplement companies guarantee viability only at manufacturing. Another aspect that sets 1MD Complete Probiotics Platinum apart from other supplements is the fact that the 11 strains in its composition are clearly identified on the official website and on the supplement’s label. This makes it easy to find the clinical studies that refer to those specific strains, and assess their health benefits. Even the CFU count for each strain is available. The capsules are made from vegetable cellulose, and they also contain long grain rice flower. They ensure delayed the release of the probiotic strains, protecting them against stomach acid and allowing them to reach the intestines safely. Another important ingredient in this supplement is the NutraFlora Prebiotic Fiber, whose purpose is to feed the probiotic strains, ensuring their viability and helping them colonize the gut. Unfortunately, not everything about 1MD Complete Probiotics Platinum is this encouraging. The first thing we noticed about it was the high price. At $49 + $5.95 (shipping), the daily costs end up at around $1.83, making this supplement one of the most expensive. You can, indeed, save a few bucks by ordering 3 or 6 bottles at the same time, but the price would still be rather high. 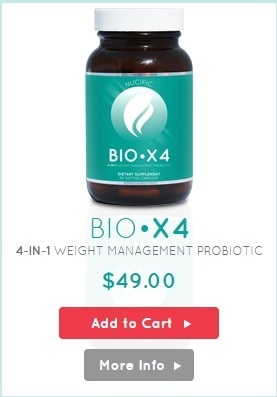 To be worth it, this probiotic should really work some miracles. The bad news does not stop here. It seems this supplement induces quite serious side effects, ranging from stomach pain to bloating, nausea, and gas. If you do decide to give it a chance, we recommend that you begin with a lower dose. So, on the first days of use, take the capsule apart and empty some of the powder. To get a better idea about how this supplement works, and what it can accomplish, let’s look at its composition. As mentioned, its ingredients are 11 probiotic strains that we will discuss in depth below, the NutraFlora Prebiotic, vegetal cellulose, and long grain rice flour. Bifidobacterium lactis B42L™ (15 billion) – This strain is among the most effective at fighting lactose intolerance and celiac disease effects while improving fiber, sugar and macronutrient digestion. It also boosts the immune system, regulates cholesterol, alleviate ulcerative colitis, and antibiotic-associated diarrhea. It can be a powerful adjuvant in treating respiratory conditions and infections and maintaining bowel health. Lactobacillus acidophilus L61A™ (15 billion) – In alternative medicine, this 1MD Complete Probiotics Platinum strain is a common remedy for traveler’s, antibiotics, and rotavirus diarrhea, irritable bowel, vaginal infections, baby colic, and children’s lung infections. It seems to alleviate Crohn’s disease, lactose intolerance, cold sores, and acne while lowering cholesterol and cancer risk. However, not all of these health benefits have been actually proven. Bifidobacterium longum B12L™ (4 billion) – Although not as popular as the preceding strain, this one is just as beneficial. It helps relieve gastrointestinal discomfort related to stress, attenuates anxiety, and reduces the risk of developing colon cancer. Maybe its most important ability is to calm irritations. Bifidobacterium bifidum B66B™ (4 billion) – This strain gives 1MD Complete Probiotics Platinum the power to break down fiber and sugar, populate the intestinal lining with good bacteria, and stimulate the immune system. It also produces vitamins line K2, B12, and biotin. Recent studies suggest it can reduce cold and flu incidence. Lactobacillus casei L30C™ (4 billion) – It is one of the most helpful strains for gastrointestinal issues, working well both on its own and combined with other strains. Studies showed it can relieve constipation, and diarrhea caused by antibiotics and infections. It also helps with weight management and improves resistance to insulin. Finally, this strain could help 1MD Complete Probiotics Platinum alleviate rheumatoid arthritis symptoms and inflammations. Lactobacillus plantarum L23P™ (4 billion) – It maintains the balance between good and bad bacteria, improves digestion and optimizes vitamin and mineral absorption. It actually synthesizes nutrients like L-lysine. Other health benefits include bacterial translocation reduction, prevention of hospital-contracted infections like those with C. difficile, relief of antibiotic side effects, and reduced risk of colorectal cancer. Lactobacillus gasseri L22G™ (1 billion) – This 1MD Complete Probiotics Platinum strain is one of the most powerful adjuvants when it comes to weight loss and metabolism stimulation. It also lowers cholesterol, reduces allergic reactions, alleviates asthma symptoms in children, lessens menstrual pain, and improves response to H. pylori treatments. Lactobacillus salivarius L1OS™ (1 billion) – The available research suggests this strain can treat digestive and intestinal problems, from lactose intolerance to antibiotics-related diarrhea and irritable bowel syndrome. It also lowers blood pressure and cholesterol and boosts the immune system. Lactobacillus rhamnosus L08R™ (1 billion) – The presence of this strain in 1MD Complete Probiotics Platinum suggests it lowers anxiety and depression symptoms, improving mood. It could also prevent diabetes and weight gain, and treat gastrointestinal problems like IBS, seasonal allergies, urinary infections, and low immunity. It is among the most resilient strains, striving in acidic environments. Lactobacillus bulgaricus L88B™ (1 billion) – This strain was the focus of numerous studies. Although not all of them were conclusive, the list of health benefits is impressive: increased immunity, leaky gut, IBS, diarrhea and nausea alleviation, cholesterol decrease, dairy digestion and oral health improvement, inflammation, dyspepsia, and HIV symptoms relief. Bacillus coagulans (Lactospore®- (billion) – This 1MD Complete Probiotics Platinum strain seems to be very effective at treating diarrhea (traveler’s, antibiotics and rotaviral), IBS, IBD, ulcerative colitis, Crohn’s disease, and Helicobacter pylori infections, improving digestion, and boost immunity. It seems to prevent cancer and respiratory infections, as well as enhance vaccine effectiveness. NutraFlora Prebiotic Fiber (100mg) – This is an effective prebiotic, consisting of pure short-chain fructooligosaccharides. Studies linked it to digestive health improved intestinal flora balance. The official website and the product label assure that this supplement does not contain any dairy, gluten, soy, eggs, shellfish, or GMOs, so it should be safe, at least as far as allergies are concerned. The ingredients list looks very encouraging as well. The only ingredient that might induce allergic reactions is the long grain rice flower. It is well known that some people are allergic to rice. If you are among them, you should consult a doctor before taking this supplement, just to be sure. As mentioned above, this supplement does not come cheap. The 30-day supply costs $49, plus $5.95. Ordering 3 bottles will help you reduce costs to $43, and ordering 6 bottles will decrease costs to $37.33. It will also let you save the $5.95 for shipping since this service is provided for free. This means your daily costs can drop from $1.83 to $1.25. The manufacturer seems to be offering another 10% discount on first-time orders. Even so, this supplement is in the high-price range. There are much more affordable supplements out there. It could be worth it if it provided all the claimed benefits, but you need to test it in order to determine that. Luckily, you can order the supplement, test it, and return it if it disappoints you. Although the official website does not mention any side effects, it seems this supplement does induce stomach pain, gas, and bloating on the first days of use. A few users reported feeling nauseous as well. Of course, these are usual symptoms with probiotics, especially at such a high CFU. They are the sign that the bacteria is alive and begins to take control of your gut. If you are willing to put up with some discomfort for a couple of days in order to improve your health, you can begin with just half a capsule, and increase the dosage later on, when your body gets used to the change. We love it when companies stand by their products, and this is the case here. 1MD gives buyers 90 days to try the product and return it. This means you can order the 3-bottle pack if you want, to benefit from the lower price and skip the shipping costs, and return the empty bottles before the deadline expires. Just make sure you keep the empty, opened, and unopened bottles, as well as the invoice for the shipping. Where to Buy 1MD Complete Probiotics Platinum? Given the 90-day guarantee and the discounts the manufacturer provides, we recommend that you order the product through the official website. Competition is tight, and so is your budget. You want what is best, at the lowest price possible. This product could qualify, due to its impressive ingredients, consistent guarantee, and reputed manufacturer. 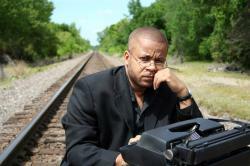 However, there is a price involved, and it concerns both your finances and your comfort. The price of the supplement is quite high, and the side effects could mess up your daily routine on the first days of use. If you feel you can live with these inconveniences, 1MD Complete Probiotics Platinum could very well be the solution you were looking for. 2 Comments on "1MD Complete Probiotics Platinum Reviews"
What should I take for flatulence? I’m female, 65, eat well and hike miles a week! I take vitamins and a probiotic now. What else can I do?